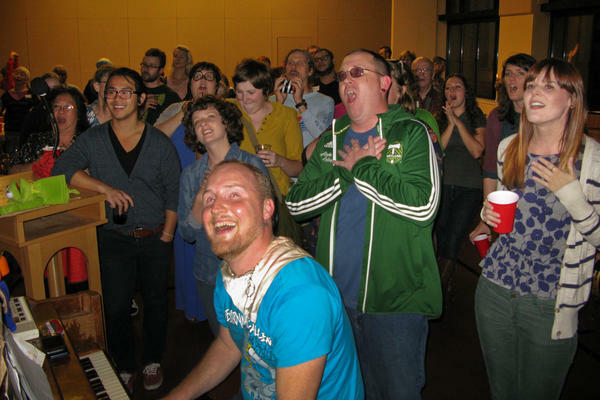 Todd Fadel, at piano, leads singers at a recent gathering of Beer & Hymns at First Christian Church Portland. 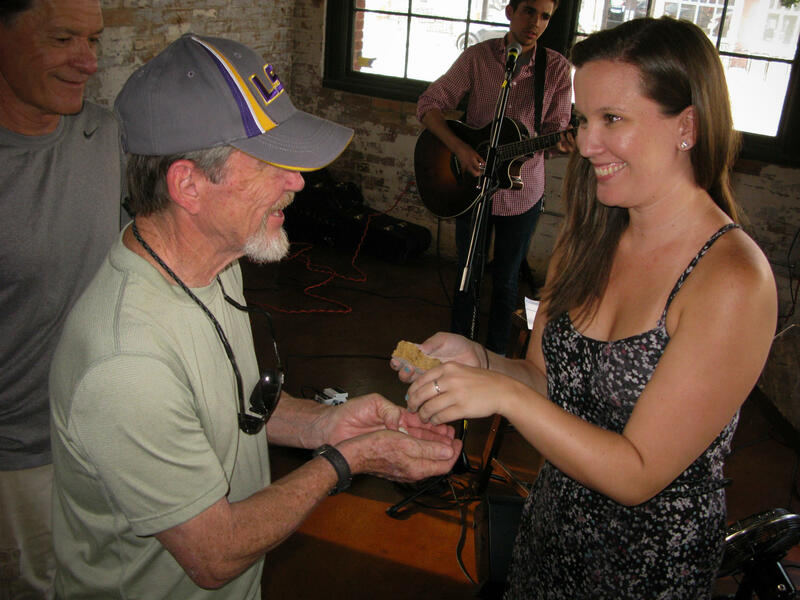 Leah Stanfield, a leasing agent in Fort Worth and regular attendee of Church-in-a Pub, hands out bread during communion at the tavern. The sign for Beer & Hymns at First Christian Church in downtown Portland, Ore.
With mainline religious congregations dwindling across America, a scattering of churches is trying to attract new members by creating a different sort of Christian community. They are gathering around craft beer. Some church groups are brewing it themselves, while others are bring the Holy Mysteries to a taproom. The result is not sloshed congregants; rather, it's an exploratory approach to do church differently. Leah Stanfield stands at a microphone across the room from the beer taps and reads this evening's gospel message. She's a 28-year-old leasing agent who's been coming to Church-in-a-Pub here in Fort Worth, Tex., for a year, and occasionally leads worship. "I find the love, I find the support, I find the non-judgmental eyes when I come here," she says. "And I find friends that love God, love craft beer." Every Sunday evening, 30 to 40 people gather at Zio Carlo brewpub to order pizza and pints of beer, to have fellowship, and have church — including communion. Pastor Philip Heinze and his Calvary Lutheran Church sponsor Church-in-a-Pub, whose formal name is the Greek word, Kyrie. Some patrons are understandably confused. They come in for a brew and there's a religious service going on in their bar. They expected Trivia Night and they get the Holy Eucharist. "I tell 'em, it's a church service," says bartender Les Bennett, "And they're, like, 'In a pub?' And I'm, like, yeah. Some of 'em stick around for trivia, some of 'em take off, some of 'em will hang out and have another pint or two." That's one of the objectives: A guy sits at the bar nursing a beer, he overhears the Gospel of Luke, he sees people line up to take bread and wine, he gets curious. Phil Heinze says pub church has now become an official — if edgy — Lutheran mission. "I'm not interested, frankly, in making more church members," Heinze. "I'm interested in having people have significant relationships around Jesus. And if it turns out to be craft beer, fine." For most of the folks who attend regularly, this is their Sunday night congregation. Church leaders, initially skeptical, are now paying attention. Last month, the regional council of the Evangelical Lutheran Church in America named Church-in-a-pub a Synodically Authorized Worshipping Community. Next year, it will call a young pastor to expand the idea to other taverns around Dallas-Fort Worth. "I think the institutional church now is getting onboard," says Heinze, "because there's a lot of anxiety frankly about the church's decline and they're trying to think outside of that institutional box." 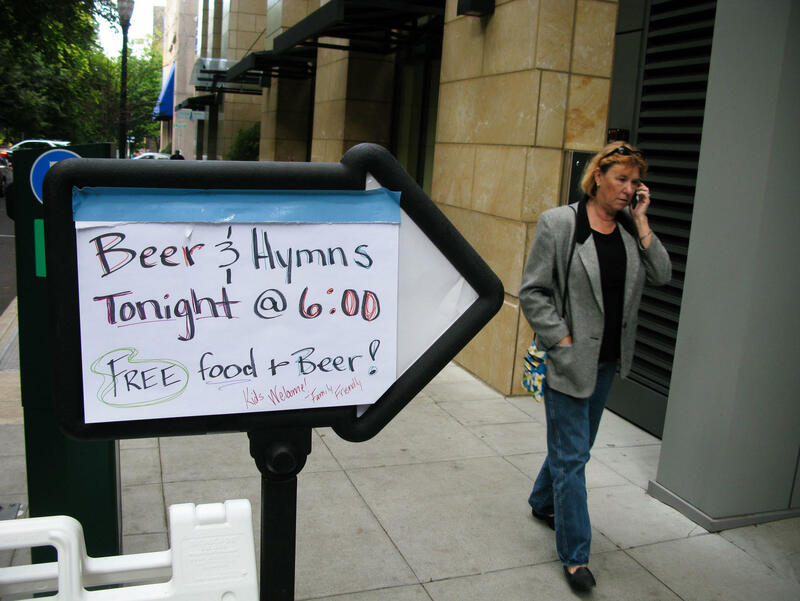 In downtown Portland, Ore., at the stately old First Christian Church, one Saturday night a month they open the parish hall for an event called Beer & Hymns. There must be 100 people here tonight, most of them young, the kind you rarely see in church on Sunday morning. They're swigging homemade stout from plastic cups — with a two-beer limit. They're singing traditional hymns from a projection screen like Be Thou My Vision. And they're having way too much fun. Like the crowd at Church-in-a-pub, a lot of folks at Beer & Hymns appear to be refugees from traditional churches. Between hymns, people can stand up and say anything they want. Jolie Shempert, a transgender person who's studying humanities at Portland State University, steps up to the mike. Shempert was raised in a strict church that taught that animals don't have souls, only people do. But Shempert's beloved dog, Gunner, has just died. "I want to sing this song in defiance of that because Gunner was my friend. And he has emotions and a personality and I had a relationship with him that's as real as any relationship I had with any human being." The Christian Church Disciples of Christ — a small mainline Protestant denomination — has experienced a steep drop in membership in recent decades. Beer & Hymns is one attempt to attract new people, in this hip, beer-loving city, while keeping a safe distance away from stained-glass windows. Rodney Page is optimistic. The 78-year-old is a long-time member of First Christian Portland and a Beer & Hymns convert. "I know that initially there were some people who had some trepidation," says Page. "This church has had a history and background of being anti-alcohol, so it took some convincing for some people. But eventually people went ahead with it and it's been a great success." No one is suggesting that Beer & Hymns or Church-in-a-Pub — or any of the dozens of other beer-in-church events that are popping up around the nation — are permanent. They're transitional experiments. Amy Piatt is senior pastor at First Christian Church Portland. She's a sixth-generation Disciple of Christ and the originator of Beer & Hymns. She says in this postmodern age, what it means to attend church is changing. "It's probably, in the very near future, not going to be at 10 am on Sunday morning wearing your best shoes and tie or dress," she says. "It's going to be something different. I mean, what that is, we are still finding out, we're still learning together. But it's still holy, God is still there, and that's what's most important." To doubters, the Beer & God crowd has this pop quiz. What was the first miracle Jesus performed? Turning water into wine. With mainline religious congregations dwindling across America, churches have been creative when it comes to attracting new members. NPR's John Burnett visited a couple of Christian congregations mixing talk of salvation and everlasting life with really good beer. LEAH STANFIELD: Well, hello, all friends. How are you? STANFIELD: The gospel lesson today is from Luke 14:1. JOHN BURNETT, BYLINE: Leah Stanfield stands at a microphone across the room from the beer taps and reads this evening's Gospel message. STANFIELD: One Sabbath, when Jesus went to eat in the house of a prominent Pharisee, he was carefully watched. BURNETT: She's a 28-year-old leasing agent who's been coming to Church-in-a-Pub here in Fort Worth, Texas for a year, and occasionally leading worship. STANFIELD: I find the love, I find the support, I find the non-judgmental eyes when I come here. And I find friends that love God, love craft beer. BURNETT: Every Sunday evening, 30 to 40 people gather at Zio Carlo Brewpub to order pizza and pints of beer, to have fellowship, and have church, including communion. PHILLIP HEINZE: He took bread, gave thanks, broke it, gave it to all of them saying take and eat, this is my body. BURNETT: That's Pastor Phillip Heinze. His Calvary Lutheran Church sponsors Church-in-a-Pub, whose formal name is the Greek word, Kyrie. Some patrons are understandably confused. They come in for a brew and there's a religious service going on in their bar. They expected Trivia Night and they get the Holy Eucharist. Les Bennett is bartender. LES BENNETT: I tell them. I'm, like, it's a church service. And they're like in a pub? And I'm like yeah. Some of them stick around for trivia, some of them, you know, kind of take off, some of them will hang out and have another pint or two. BURNETT: That's one of the objectives: a guy sits at the bar nursing a beer, he overhears the Gospel of Luke, he sees people line up to take bread and wine, he gets curious. Phillip Heinze says pub church has now become an official - if edgy - Lutheran mission. HEINZE: I'm not interested, frankly, in making more church members. I'm interested in having people have significant relationships around Jesus, and if it turns out to be craft beer, fine. BURNETT: For most of the folks who attend regularly, this is their Sunday night congregation. Church leaders, initially skeptical, are now paying attention. Last month, the regional council of the Evangelical Lutheran Church in America named Church-in-a-Pub a Synodically Authorized Worshipping Community. Next year, it will call a young pastor to expand the idea to other taverns around Dallas-Fort Worth. Again, Reverend Phil Heinze. HEINZE: I think the institutional church now is getting on board because there's a lot of anxiety frankly about the church's decline and they're trying to think outside of that institutional box. BURNETT: Let's leave the Fort Worth brewpub and rocket to downtown Portland, Oregon to the stately old First Christian Church. One Saturday night a month, they open the parish hall for an event called Beer and Hymns. BURNETT: There must be a hundred people here tonight, most of them young, the kind you rarely see in church on Sunday morning. They're swigging homemade stout from plastic cups - with a two-beer limit. They're singing traditional hymns from a projection screen like "Be Thou My Vision." And they're having way too much fun. BURNETT: Like the crowd at Church-in-a-Pub, a lot of folks at Beer and Hymns appear to be refugees from traditional churches. Between hymns, people can stand up and say anything they want. Jolie Shempert, a transgender person who's studying humanities at Portland State University, steps up to the mike. Shempert was raised in a strict church that taught that animals don't have souls, only people do. But Shempert's beloved dog, Gunner, has just died. JOLIE SHEMPERT: I want to sing this song in defiance of that because Gunner is my friend. And he has emotions and a personality and I had a relationship with him that's as real as any relationship that I had with any human being. BURNETT: The Christian Church Disciples of Christ, a small mainline Protestant denomination, has experienced a steep drop in membership in recent decades. Beer and Hymns is one attempt to attract new people, in this hip, beer-loving city while keeping a safe distance away from stained-glass windows. Rodney Page is optimistic. The 78-year-old Disciple of Christ is a longtime member of church and a Beer and Hymns convert. 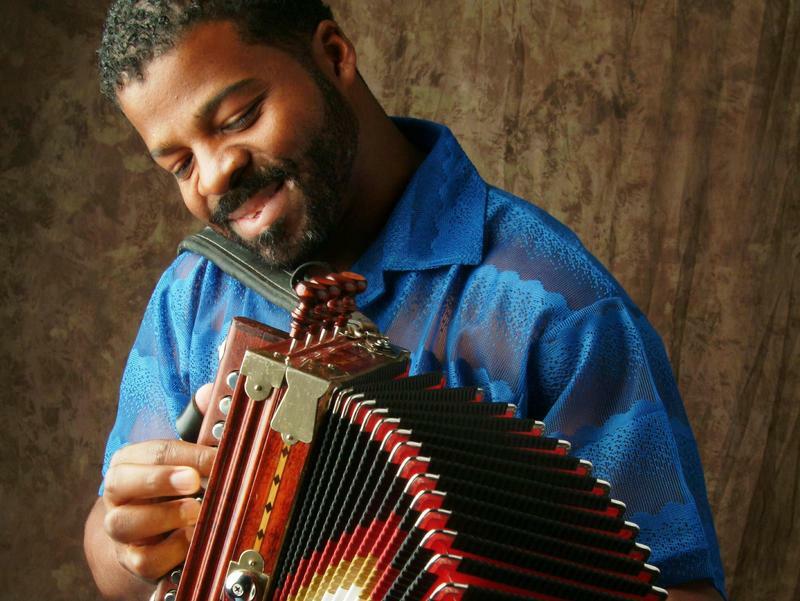 RODNEY PAGE: I know that initially there were some people who had some trepidation. This church has had a history and background of being anti-alcohol, so it took some convincing for some people. But eventually people went ahead with it and it's been a great success. BURNETT: No one is suggesting that Beer and Hymns or Church-in-a-Pub or any of the dozens of other beer-in-church events that are popping up around the nation are permanent. They are transitional experiments. Amy Piatt is senior pastor at First Christian Church Portland, she's a sixth-generation Disciple of Christ, and the originator of Beer and Hymns. She says in this postmodern age, what it means to attend church is changing. AMY PIATT: It's probably, in the very near future, not going to be at 10 A.M. on Sunday morning wearing your best shoes and tie or dress. It's going to be something different. And what that is, we are still finding out, we're still learning together. But it's still holy, God is still there, and that's what's most important." BURNETT: To doubters, the Beer and God crowd has this pop quiz. What was the first miracle Jesus performed? Turning water into wine. John Burnett, NPR News. CONGREGATION: (Singing) Amen. Transcript provided by NPR, Copyright NPR. Killing in the name of God — that’s the topic of a special event tonight in Jacksonville featuring First Coast Connect's very own God Squad. WJCT's Melissa Ross be moderating the discussion on the rise of religious fundamentalism around the world and the dangers of extremism. The modest, cream-colored '50s-era chapel that's home to St. Peter the Apostle Catholic Church in Houston looks like many other places of worship you might find in urban America. The first clue to a unique tradition here pulls up Sunday afternoon.